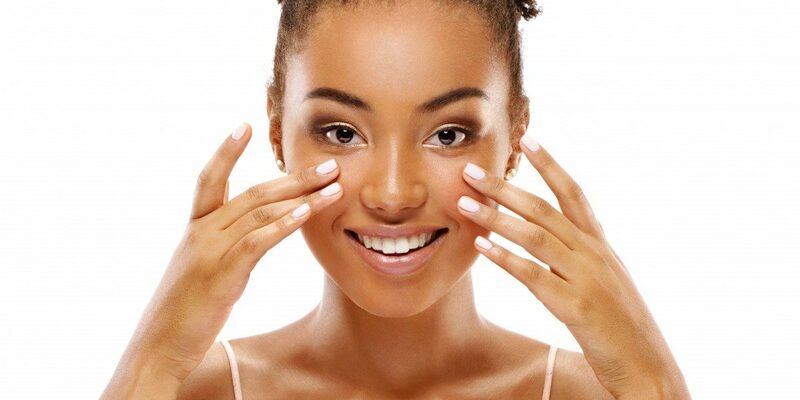 As your body’s largest organ, it’s important to keep your skin healthy and functioning at its best. In today’s post, we’ll provide you with a few tips that can help you keep your skin healthy and vibrant. If you’re concerned about the health of your skin, then get in touch with Hill Family Medicine to learn more about our skin care services. Whether you need acne treatment, wart removal, or a specialty treatment of any kind, our Bee Cave skin care clinic is equipped to provide you with the care you deserve! Moisturizing your skin is incredibly important, especially if you’re washing your face and applying other products each day. 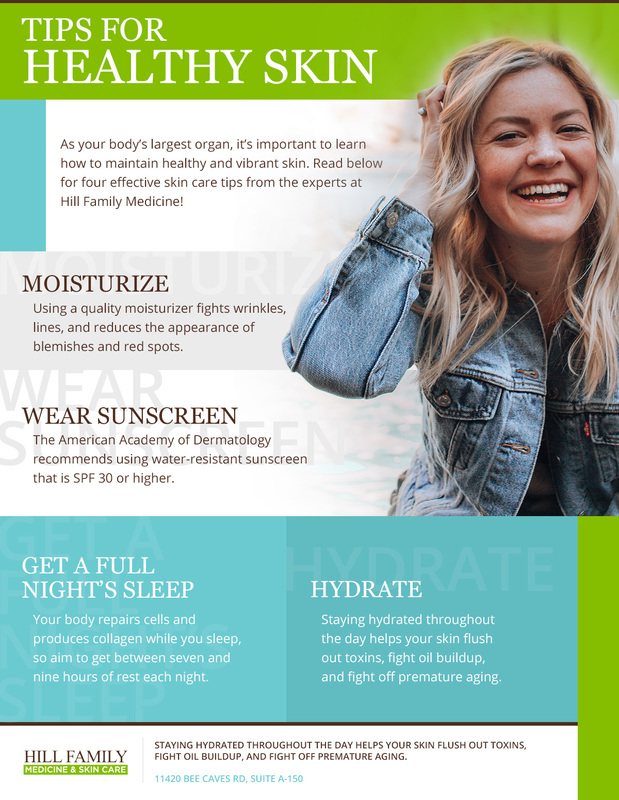 In addition to fighting wrinkles, lines, and reducing the appearance of blemishes and red spots, using a high-quality moisturizer reduces your risk of skin cancer by providing your cells with the resources they need to repair themselves. If you suffer from extremely dry skin, then you may want to invest in a deep moisturizer that you can use once each week. Speak with our skin care experts if you would like product recommendations for your skin type. Too much sun can cause a number of health problems, including premature aging, rashes, and skin cancer. 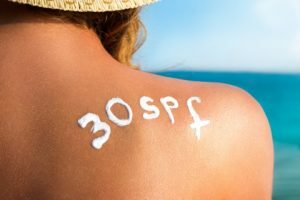 The American Academy of Dermatology recommends that everyone — including those who do not burn easily — use water-resistant sunscreen that is SPF 30 or higher. Additionally, you should look for broad-spectrum sunscreen, which protects against multiple types of ultraviolet rays. Prioritizing your beauty rest is one of the best ways to maintain a healthy and vibrant complexion. Your skin produces collagen while you sleep, which prevents wrinkles and creases from developing. Your body is also better able to circulate blood while you sleep, which can promote a more youthful and bright appearance. Aim to get between seven and nine hours of rest each night in order to keep your skin looking its best. The body needs water in order to function properly, and your skin is no exception. Staying hydrated throughout the day helps your skin flush out toxins, fight oil buildup, and fight off premature aging. Your skin will also appear brighter, plumper, and softer when your cells are adequately hydrated. Aim to consume at least 2 liters of water each day to keep your skin soft and radiant. Make an extra trip to the water fountain throughout the day at work, or invest in a bigger water bottle you can bring anywhere you go. We hope that today’s entry will help you maintain healthy, vibrant skin. Be sure to bookmark our blog page, as we plan to provide you with even more helpful skin care tips in the coming weeks and months. If you would like to schedule an appointment with Hill Family Medicine to discuss your skin, then call our office or fill out the form at the bottom of this page.